State Senator Chris Jacobs, in collaboration with the University at Buffalo School of Pharmacy and Pharmaceutical Sciences, will distribute thousands of bags specially designed to render unwanted drugs useless for purposes of safe, environmentally-friendly disposal. Jacobs joined pharmacy students on UB's South Campus Thursday to demonstrate how the Deterra Drug Deactivation bags work. 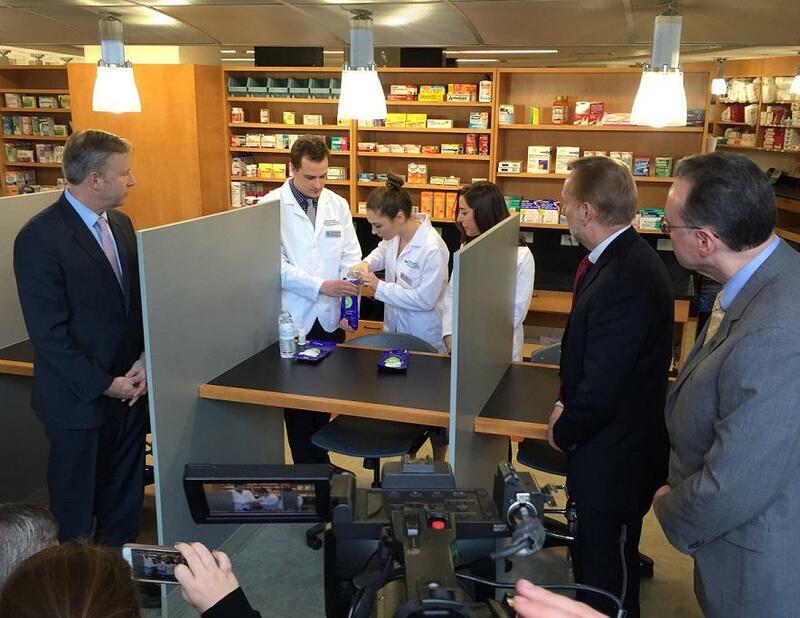 State Senator Chris Jacobs (left) watches as students of the University at Buffalo School of Pharmacy and Pharmaceutical Sciences demonstrate the Deterra Drug Deactivation bag. Thousands of such bags will be distributed by Jacobs' office as a strategy to eliminate unused prescription drugs which may be attractive to would-be abusers. "The drug disposal pouches are pretty easy to use. Basically, it's a zip-lock bag. You tear off the top, open it up, pour in a couple ounces of water, you put in the medicine, shake it up, zip-lock it, and it's totally biodegradable. You just throw it in the trash," said Karl Fiebelkorn, senior associate dean of the school. Each bag allows the user to get rid of 48 pills, six ounces of liquid or six medicinal patches. People interested in disposing of unused drugs may also use a zipped plastic bag and a substance such as kitty litter, dirt or motor oil but supporters of the deactivation bags point out that the domestic zipped bags are non-biodegradable and may last within a landfill for a significant period of time. Simply flushing drugs down the toilet is no longer acceptable, Fielbelkorn explained, because the medications may find their way back into a public water system, including a drinking water supply. Jacobs plans to make the bags available through his district office and also through his "Senator on Your Street" program, which schedules community office hours in the towns he represents within the 60th Senate District. The senator announced that his office is also sponsoring two upcoming Narcan training sessions, one on February 19 at the North Buffalo Community Center and the second on February 27 at Brighton Volunteer Fire Company #5 in the Town of Tonawanda. The bags, meanwhile, will also be made available at community events like the Senior Scam Prevention Seminars that Jacobs sponsors. Seniors' prescriptions are considered a significant source of supplies for those who would abuse them. "We also do a lot of this in partnership with the senior community. As we know, that community in particular has a lot of opioids in terms of treatment," said Jacobs, who co-chaired the State Senate's Task Force on Heroin and Opioid Addiction for more than two years. "We've heard stories of nieces and nephews and others going in medicine cabinets."